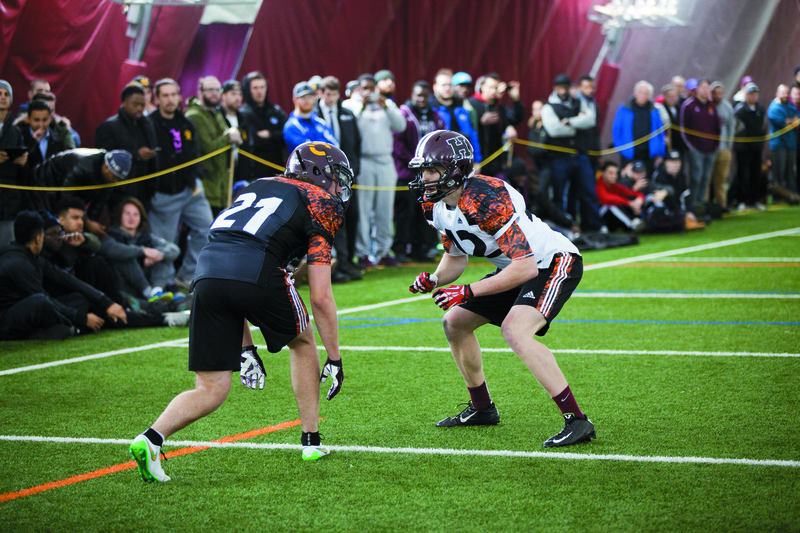 Over 40 football athletes gathered at Concordia’s Loyola campus on March 9 in hopes of turning their performance into a shot at making it to the CFL national combine in Toronto. Stingers cornerback Rashawn Perry waits to do a drill during the CFL combine. Photo by Marie-Pierre Savard. The Canadian Football League eastern regional combine, in Montreal, had three Concordia Stingers showcasing their skills in front of a jam-packed audience. The combine was held at the Stingers Dome, which instilled a state of solace and ease in Stingers cornerback Rashawn Perry’s mind while performing his drills. Perry went on to say that he was very proud of his fellow teammates at the combine and felt like their success lied on the shoulders of the Stingers coaching staff and the football program in its entirety. Stingers slotback Daniel Skube lines up for a drill during the combine. Photo by Marie-Pierre Savard. Daniel Skube, Concordia’s fourth year slot receiver, felt like he kept his composure throughout the day and expressed a strong sign of approval and respect towards the nature of the combine and the players within it. The drills which took place after lunch saw increased spectatorship and it was quite obvious that the players on the field were feeding off of the ambience. Whenever a big block was made by a running back in the one-on-one drills, or a big hit was registered by a linebacker, the crowd sent a howl that rebounded off of the dome walls which added a dynamic flare to the event. The combine saw several different faces attending such as scouts, coaches and even former players rooting for their friends. Current Winnipeg Blue Bomber and former Concordia Stinger Kris Bastien attended the event and was cheering on his longtime friend Daniel Skube. “I know Skube is the kind of guy that performs when he’s calm, so I just told him to be confident and do what he’s been doing his whole life,” said Bastien. Bastien, who skipped the regional stage altogether and moved straight to the national combine in his final year of CIS football, mentioned the jump from college football to professional is not an easy process and takes time. When asked about how the popularity and player caliber of CIS football has developed over time, Bastien had nothing but good things to say. With great talent comes great opportunity, however, third-year Concordia linebacker Arto Khatchikian knows very well that education undoubtedly comes first. “I won’t be returning next season, I’m done. It’s time to focus on school and get a degree,” said Khatchikian. He also mentioned he worked extremely hard for this day and put in countless hours with his coaches to prepare. Stingers offensive line coach Ted Karabatsos mentioned he was very proud of the way his players performed, despite not having any Concordia athletes moving on to the regionals in Toronto. When the combine concluded, four players were selected for the nationals in Toronto. This included McGill fullback Devon Stewart, St. Francis Xavier University fullback Donald Tabor, Ottawa linebacker Marc-Antoine Laurin and Carabins defensive back Maiko Zepeda. Stingers defensive back Mikael Charland and offensive lineman Roman Grozman both earned a spot at the national combine without having to attend this year’s regionals. They’ll both look to impress the eyes of CFL scouts and improve on their draft stock. This year’s CFL draft will take place May 10 in Toronto.